High visibility landscaping at a competitive price. We specialize in providing high quality commercial and residential landscaping services. 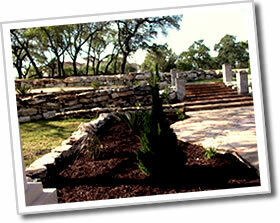 River Rock Landscape is a full service landscaping business located in San Antonio Texas. We specialize in providing high quality commercial and residential landscaping services. We provide prompt professional services from installation to maintenance. Our goal is to provide high visibility landscaping at a competitive price. We know you will be impressed with our core experienced team of hardworking professionals. River Rock Landscape. has the capabilities and expertise of a national landscape services firm, while giving local clients individual and personalized attention, serving a diverse client base that includes corporations, institutions, governments and exclusive individuals. Serving San Antonio By integrating and leveraging our combined resources and practices of its business units, River Rock Landscape offers products and services designed specifically for each client's particular needs. River Rock Landscape has had a significant operation right here in San Antonio and Surrounding area since 2001, offering a broad array of landscape management services to help clients preserve and improve their landscape investment. We create an environment perfectly suited to you by determining your preferences and the way in which you use your home or business. In addition to the benefits of a customized outdoor space, professional landscaping can boost the resale value of your property to up to 15%. Everyone was extremely helpful. They all went out of their way to make sure we were completly satisfied with the project. I would do it again! JD.